The Lewis family, l-r, 12-year-old Harry, a pupil at Ellowes School, mum Lesley and six-year-old Eliza who goes to Cotwall End Primary School, Sedgley. Picture courtesy of Daniel Graves Photography Show. Dudley Zoo was the venue for some spooky goings-on this Hallowe’en, with many Sedgley residents paying the popular tourist attraction a visit and getting into the spirit. 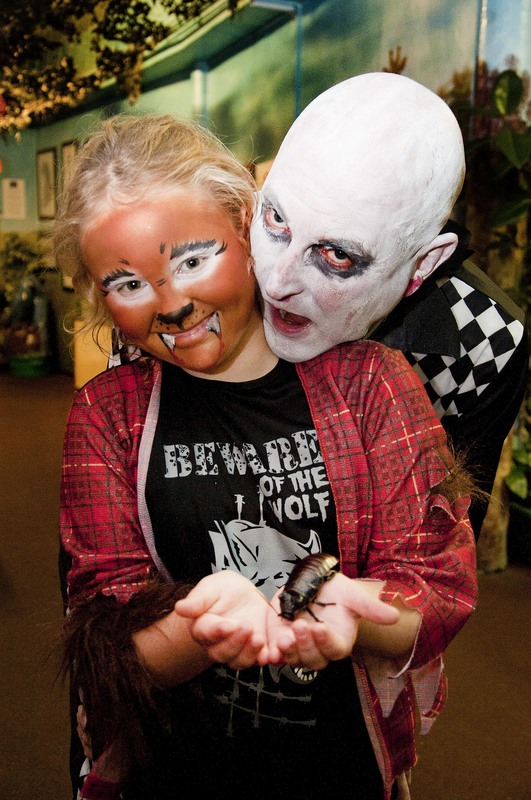 Six-year-old Eliza Lewis, a pupil at Cotwall End Primary School, was among the many youngsters who took part in a series of activities organised by the zoo for half term Hallowe’en fun. Among the new arrivals at Dudley Zoo were a witch’s favourite – three giant smooth-sided toads (Bufo guttatus) – which are among the largest in the world. The new arrivals have been named Porthos, Athos and Aramis. 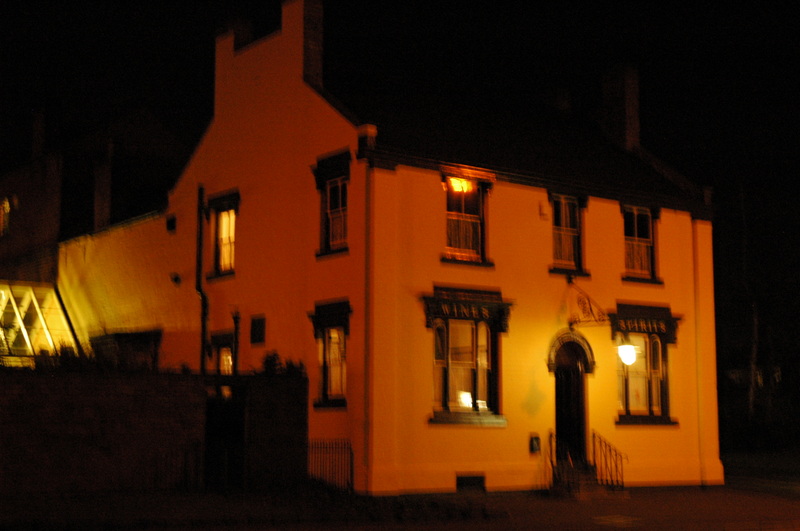 Hallowe’en half-term events included themed talks and feeds, ending with a Hocus Pocus evening on Monday, October 31. 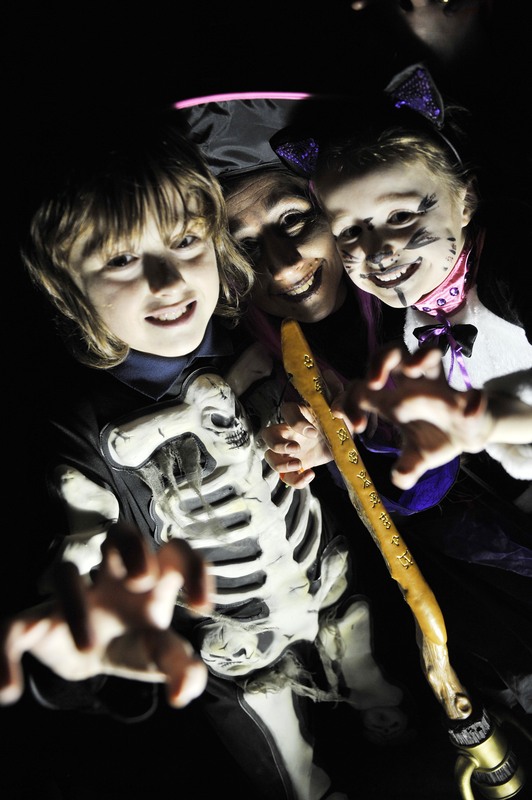 For adults, there’s still a chance to join the spooks of Dudley Castle with this year’s Carnival of Darkness, due to an extra date being added on Friday, November 4. The carnival is suitable for 16-years and over and will run from 8pm to midnight, with last admissions at 9pm. To book tickets visit www.dudleyzoo.org.uk or call 01384 215313 for more details. 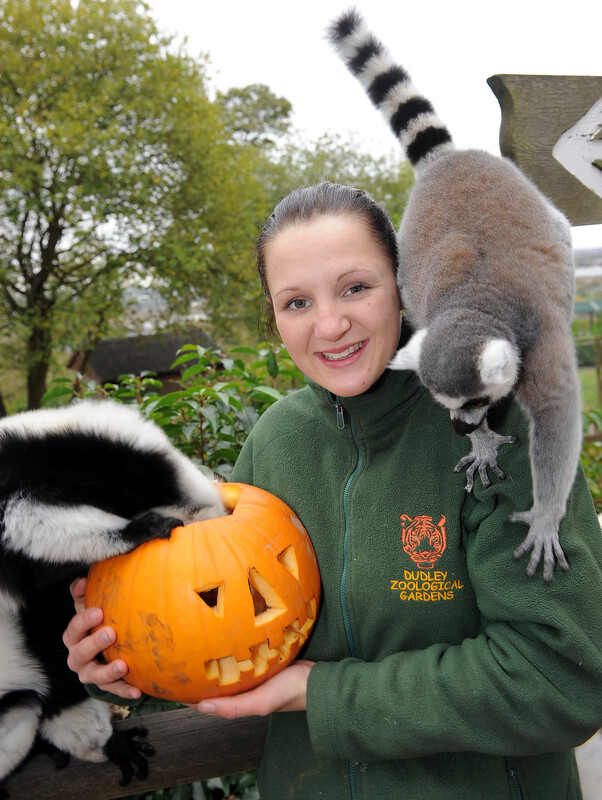 Local residents wondering what to do with all those specially carved pumpkins might also be interested to learn that these make ideal treats for the zoo’s lemurs, which have been enjoying Hallowe’en treats, thanks to kind supporters who donated pumpkins aplenty. Across the site keepers have been filling the hollowed-out vegetables with fruit and treats for the animals to seek out and encouraging them to use the decorative skin as a toy. 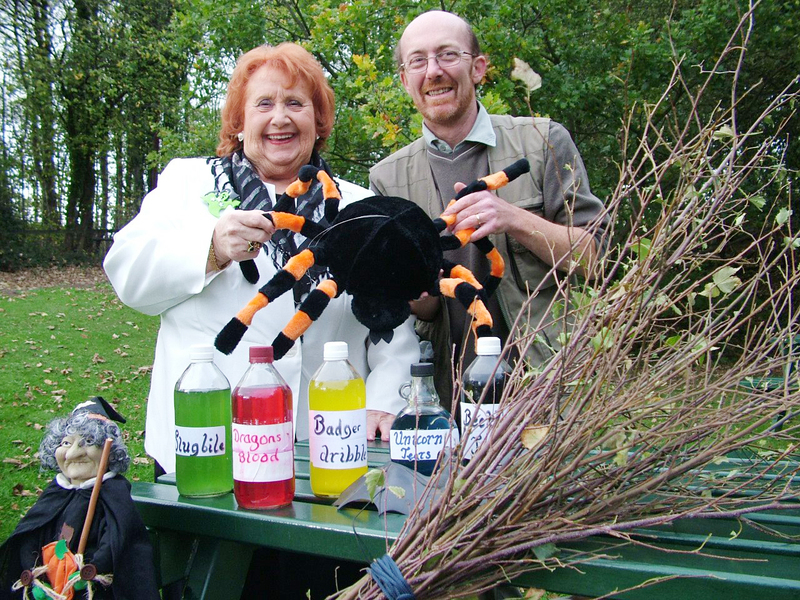 Baggeridge Country Park was the venue for some ghastly Halloween potions and witches’ brews this week, when a group of young people braved the wind and rain to learn about the medicinal uses and folklore of herbs. The event was one of a series of activities held at the park in Gospel End Road, Sedgley, during half term, which aim to get local people involved with nature and the stunning countryside available on their doorstep. Other activities included making broomsticks from scratch using the natural materials available in abundance. Park manager, Steve Gallis, says: “It was great to find that, despite it being a wet and pretty miserable afternoon, eight young people turned up for potions class. We looked at the ‘magical’ medical uses and folklore of wild herbs and brewed up some bubbling potions – nobody minded about the rain! “The potions class involved the use of a variety of fun ‘ingredients’ such as badger dribble, slug bile, dragons blood and unicorn tears – all completely made up for effect with coloured water mixed with bicarbonate of soda which, when mixed with the ‘magic’ ingredient (vinegar), gives a very impressive bubbling potion. “Before mixing our witches’ brews, we had a look at a range of plants and the folklore and medicinal uses. We looked at willow, the bark of which was used to cure headache – not surprising really, as it contains salicylic acid, which is basically Aspirin. “Other plants, such as like Yew, are really quite poisonous, although this now has a modern medicinal use as the poison Taxine, which has been used as the basis for the cancer drug Taxol. “The tree which is supposed to protect against poisoning is the oak – apparently a concoction of its bark protects you against poison. There may be some truth in this, as it would contain a lot of tannin which would probably stop the stomach from absorbing anything – never mind poison! “We also looked at mugwort, which was believed to protect against magic spells. Another nice little tale about this plant says that if you bury a piece of coal under the mugwort, leave it a month then dig it up by the light of the full moon and then place it under your pillow, then that night you will dream of the person you are going to marry! “A lot of people know St John’s wort, as it is widely used as a natural anti- depressant and was known back in the 1600’s as a ‘cure for the melancholy’. Steve is a mine of information and this event was no doubt helped by his regular informative updates on the country park’s Facebook page, which has shown how social media can become and invaluable tool for engaging the local community. Since setting up the page earlier this year, Steve has seen increased interest in Baggeridge and its stunning landscape, which is home to a wide variety of wildlife. Formally the Baggeridge Colliery and part of the original Himley Estate of the Earls of Dudley, the site has now been transformed into 150 acres of attractive country park. Baggeridge has numerous facilities for outdoor pursuits including the exciting new Aerial Ropes course. The quality of the park and its range of events has resulted in Baggeridge winning a national Green Flag award for the 13th year in a row. 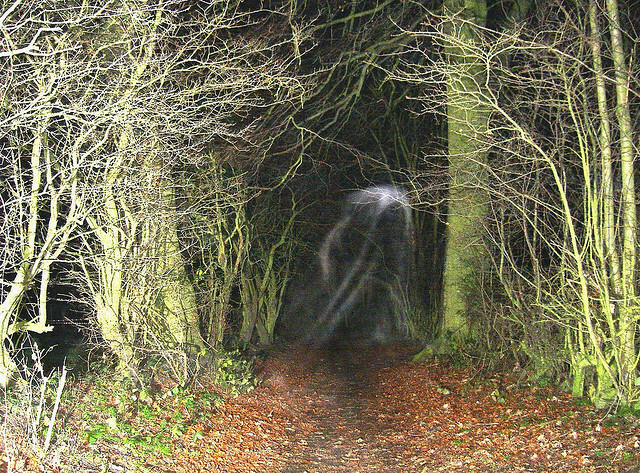 Visit http://www.sstaffs.gov.uk/default.aspx?page=12695 to learn more about Baggeridge Country Park. 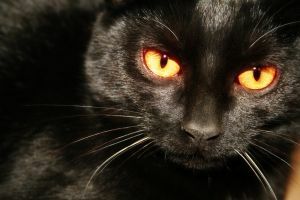 Witches’ companions and bringers of good or bad luck – for centuries, black cats have played a major role in folklore, mythology and superstition. And, perhaps because of this, many cat re-homing charities find it’s these unfortunate moggies which often get left behind. But today, October 27, Cats Protection, which has branches near to Sedgley, has launched its Black Cat Awareness Day campaign, which it hopes will redress the balance for these forgotten felines. According to the charity, black cats are often overlooked by would-be adopters and many of them remain in its care for longer than others. And, to really get people’s attention, the charity is running a social media campaign, but needs the support of others to make it a success. Anyone who wishes to lend support can upload an image of their black cat to the charity’s Facebook page or its Flickr group. Celebrities who own black cats have also got behind the campaign, including comic and actor David Schneider, author and journalist Jilly Cooper OBE, fashion icon Twiggy Lawson and Simon Tofield, creator of the hilarious internet sensation, Simon’s Cat. Visit http://www.cats.org.uk/get-involved/black-cat-awareness-day for more information. Black Cats as witches’ companions. It was largely in the Middle Ages that the black cat became affiliated with evil. Because cats are nocturnal and roam at night, they were believed to be supernatural servants of witches, or even witches themselves. Folklore has it that if a witch becomes human, her black cat will no longer reside in her house. Some believe that black cats are witches in disguise, or witches reborn. Others believe black cats are witches familiars (beings that aid witches in performing their craft). Not all familiars were black cats though – some were cats of other colours and dogs, pigs, and other animals were also subject to superstition and suspicion.